As guests congregate under chandeliers and exquisite canapés are handed round, a group of pinafored women enter the wood-panelled function room at Canada House. They sit in a row and silently, industriously begin to paint small watercolour clouds. An elaborately costumed Pearly Queen looks on, talking and laughing with the audience. “It’s fantastic!” she tells me. “The project is all about bringing communities together, re-connecting with the history of our manor.” Diane Gould (HRH The Pearly Princess of St Pancras) is taking part in artist collective foreign investment (FI)‘s performance work Sky Mile. The project speculates on the value of sky above the Kings Cross area of London, which has been subject to rapid urban development and privatisation over the last two decades. FI are proposing the sale of ‘sky shares’, sections of sky within a half-mile radius of Kings Cross station, their value determined in accordance with local property prices. 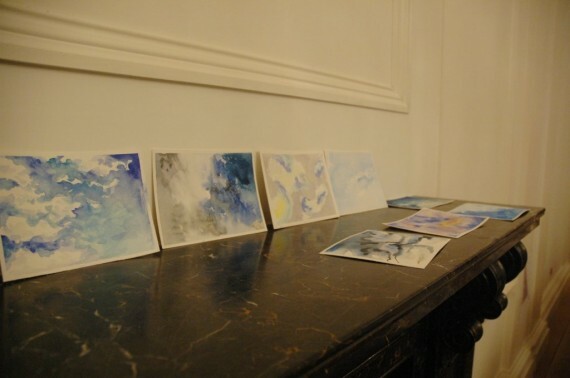 The watercolour paintings, authenticated and stamped by Diane, serve as certificates of the sale transactions. A Cockney sing-along will accompany part two of FI’s performance the following day (“Dad’ll be playing the spoons!”), and a percentage of proceeds from any share sales will go to a local charity supported by the Pearlies. As FI’s performance continued at one end of the room, talks by representatives of the London Wildlife Trust, the Linnean Society and the Natural History Museum were given at the other, as well as presentations by some of the Wild New Territories artists. We were reminded how important simple contact with the natural world is for city-dwellers; that children who spend too much time playing computer games are dangerously disengaged from the natural world; and that the biggest driver of biodiversity loss is habitat change, triggered by the exploitation of place by humans. By the time Edgar Heap of Birds presented his work the evening’s message was becoming yet more cautionary, the tone yet more uneasy. Heap of Birds is an artist of Cheyenne and Arapaho descent who creates large-scale text banners that draw attention to the violence carried out to indigenous populations in North America, South America and the Caribbean by European colonies. He told harrowing stories of the displacement and suffering of his Native American ancestors coerced into performing in Buffalo Bill’s Wild West shows in Britain and Europe. 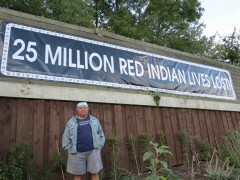 His “message for London” for this exhibition is emblazoned on a 30′ banner near St Pancras station: 25 MILLION RED INDIAN LIVES LOST. For Wild New Territories, Cheung has created a new sculpture (as yet untitled) from a modified beehive, a bull’s skull and a swarm of wild honeybees. 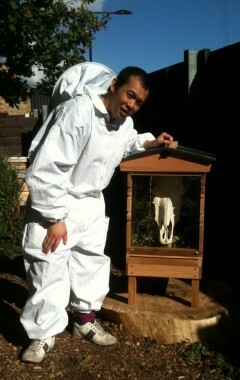 For Cheung, the skull represents the stock market; the bees, society. Over the course of the exhibition the bees will colonise the skull, building their honeycomb around and over the bone. Cheung often juxtaposes symbolic imagery of man and beast to explore ideas of conquest, subjugation and power. This is the first time he has used bees in his work as a way of exploring the dynamics of the global economic landscape and he has been mesmerised by their activity.